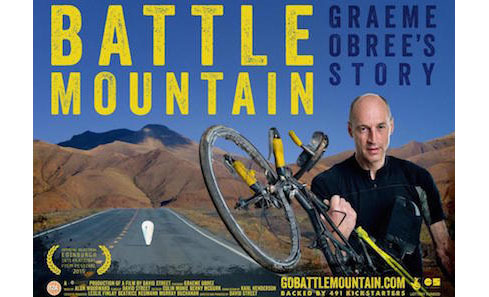 Filmmaker David Street’s feature documentary debut Battle Mountain: Graeme Obree’s Story follows the Scottish cycling icon on his quest to challenge for the world land speed record at Battle Mountain in Nevada in 2013. The film charts the extraordinary, and endlessly challenging, journey with unflinching honesty and humour. Following a successful UK cinema tour, the film is now available on video on demand services. In this exclusive interview, director David Street tells us about his own challenging journey to bring the film to life. How would you sum up the film? 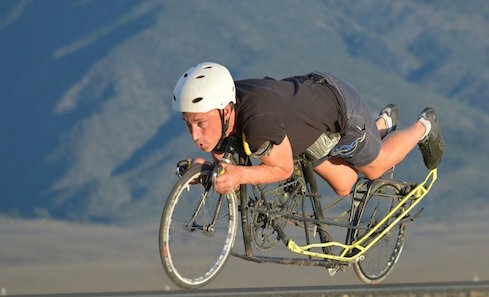 Battle Mountain: Graeme Obree’s Story is a feature documentary following the force of nature that is Graeme Obree over the course of two years, as he builds a bike to challenge for the human powered land speed world record. It starts in Graeme’s kitchen in Saltcoats, Ayrshire and ends in Battle Mountain, Nevada. It charts the highs and lows not just of this epic journey, but also the life of this iconic Scot. It pulls no punches and covers everything from suicide attempts and drug taking to his love of cycling and family. What first attracted you to telling Graeme’s story? I knew about Graeme’s phenomenal achievements in the 90s, building his own bike, becoming a world champion and world record holder and inspiring people like Sir Chris Hoy along the way. He certainly wasn’t an unknown quantity to me but he had seemed to disappear from the national sporting consciousness, which was rather strange with the UK’s rise to prominence in cycling events. When I was asked if I was interested in trying to make a film about Graeme it was a no brainer. There were so many questions that needed answers; “Where had he been?”, “What had he been doing?”, “How could some one who had battled Chris Boardman and been to the Olympics just disappear?”. As well as answering those questions, I’ve always been fascinated by how people build things so to see first hand how someone Chris Hoy refers to as a genius, design and build a new machine was an opportunity I could not resist. How did you set about bringing the story to the big screen? The original idea was to make a TV documentary, so we shot a taster tape that a major production company tried to sell to all the broadcasters. None of them thought the idea would have enough appeal for their audiences. It was a case then of did we let the idea die or did we carry on with it? I felt that it was an amazing story of human resilience and creativity and one that should be documented. I had my own camera and sound equipment. Graeme only lived an hour’s drive away. If I was happy to invest my time and pay for some fuel to get me to Graeme’s I could film at virtually no cost which is what I did for two years. After we got back from the USA. I felt I needed another set of eyes and to look at the material, I’d shot and recorded the sound, directed and produced it on my own. It was important to bring in an editor who wasn’t invested in every shot or sequence the way I was. To do this we ran a successful crowd funding campaign through Kickstarter. This would pay for 12 weeks of editing – unfortunately the first edit took 39 weeks – private investors helped to fund that. Even after all that time the film was not finished and we had run out of funding, but we were able to secure support from Creative Scotland to help us finance finishing the film. Given the challenges in getting the film made, do you see parallels between yours and Graeme’s battle against the odds? Most definitely. There were so many points along the way where I thought surely Graeme will not carry on and possibly even more where I thought I can’t carry on. Somehow Graeme overcame all the physical and mental obstacles, he carried on and reached the end of his journey. Strangely following him to this point was the easy part for me, the next nearly three years have been the hardest with many sleepless nights, missed deadlines, struggles to find the money to keep going and even now when it is finished as a film, a battle to get it in front of an audience. One moment really sticks out. When we finally locked the picture in May 2015 I was sat in the edit suite with Creative Scotland’s Leslie Finlay and Scotland’s top editor Colin Monie I really wanted to celebrate and couldn’t understand why Leslie and Colin were looking at me quizzically. I asked what was the matter, they both laughed and said you might have finished the film part of it but now the hard work starts – you’ll spend the next two years trying to sell it. How right they were. The film premiered at the EIFF and has just finished screening around the UK. What was the public reaction? We had two sell out audiences at EIFF and great reviews from the local and industry press – The Hollywood Reporter was especially complimentary about it, so I hoped we would get a good distribution and sales deal on the back of it. That didn’t happen so we ended up doing a hybrid distribution scheme doing a 40 cinema UK Q&A tour from Bath, Poole and Southampton in the south to Aberdeen and Inverness in the North and form Cardiff in the West to Norwich in the East. We really did cover the whole country. It is now being rebooked in to some of the same cinemas and other cinemas are asking for it without the Q&As. We estimate that over 6,000 people will have seen it now on the big screen. The response has been amazing, right across the board people seem to have loved it. This was my first feature film after years making TV programmes. Going on the UK tour with the film was an amazing experience being in the audience when people are watching it, seeing which points work and which don’t. Would the audience laugh? Would they stay with it or would they walk out? Largely they laughed and no one walked out from any of the screenings we were at. They also took to social media to let us and their friends know what they thought of it. Critics have called it “unflinching, compelling, absorbing, inspirational” - what's the creative process behind weaving such a moving tale? They also called it funny and humorous and it’s the lightness of the humour that helped weave the complex elements of the film together. I’ve always made factual programmes, often investigations including secret filming, but I studied drama at college. In this film I wanted to try and bring dramatic structure to the film. When I made TV commercials one of my bosses used the old adage “make em laugh and make em cry, they’ll remember and buy”. It’s not that far away from a tragic-comic Shakespearean structure where a moment of high drama is followed by a moment of comedy or lightness. I wanted and hoped we could do the same with this film. With documentary you can’t write it in that way, you don’t know what will happen when you start filming. However as the filming process went on I realised that Graeme had a fabulous sense of humour and would provide the lightness and comedy, it was whether or not we would get the dark and difficult drama. Eventually all of that turned up as well as the story unfolded. I also wanted to give the film size and scope, to make it worthy of the big screen if at all possible. I wanted to contrast the tightness and claustrophobia that Graeme would suffer in his kitchen building the bike, as well as being in it when he was going for the record with the gorgeous scenery in both Ayrshire and Nevada – the locations helped with the narrative weave. The film is certainly an emotional journey – without giving away the plot, what are your personal highlights? There are so many highlights in the film for me. From being virtually inside the machines watching them close up being built, to Graeme’s openness and honesty when he’s talking about his life, to seeing him on the turbo trainer when I thought he was going to die through lack of oxygen and many, many more besides. But possibly the biggest is the music that Alun Woodward created for the film, the opportunity to give a Glaswegian musician/composer the chance to score a feature film has to go down as a serious highlight. What do you hope audiences will take away from it? I wanted to make an entertaining documentary, where people left the cinema having enjoyed spending a couple of hours of their time watching it. Then afterwards maybe ruminate on the messages that are in there. That they feel inspired to do something themselves. That they don’t feel they have to hide any mental illness, that it’s perfectly acceptable to talk about it. That you can be gay and be a world champion athlete. That any thing is possible if you want it badly enough and are prepared to work for it. Finally, how resilient the human animal can be. Where can people go and see the film? The film is still playing in selected cinemas across the UK if you log on to www.gobattlemountain.com we are keeping an up to date list of screens – the cinema is really the best way to watch it especially with the brilliant soundtrack. But if you can’t make a cinema it's now on vimeo, and also on iTunes, google, Amazon, Xbox and Playstation. 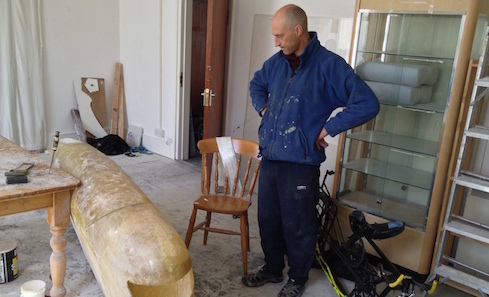 Battle Mountain: Graeme Obree's Story received £33,000 Creative Scotland Targeted Screen Funding through the UK National Lottery.